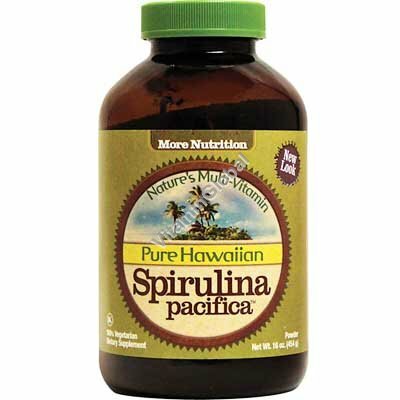 Hawaiian Spirulina Pacifica thrives in ponds fed with 100% fresh water from Hawaiian aquifers and pure, deep ocean water drawn from 2000 feet below the surface of the Pacific Ocean. This ultra pure, deep ocean water enriches Hawaiian Spirulina Pacifica® with 94 trace minerals and is a unique natural resource used in our patented Ocean Chill Drying technology which ensures maximum nutrient potency. Directions: 3 grams per day (Pure Hawaiian Spirulina Powder).